They are likely to go to school by bus. — Они, вероятно, поедут в школу на автобусе. Не is sure to return soon. — Он, несомненно, скоро вернется. Sheis unlikely to arrive tomorrow. — Маловероятно, что она приедет завтра. They are certain to invite you to the party. — Конечно, они пригласят вас на вечеринку. После этих словосочетаний употребляется инфинитив, который часто выражает действие, относящееся к будущему времени. 1 Оцените вероятность того, что эти действия произойдут в вашей жизни, и составьте собственные высказывания по образцу. Guests are unlikely to come to me at night. 2 Write about your plans for this school term. Use the structures. 3 Listen to the words and repeat them after the speaker. Mann's Chinese Theater — "Китайский театр Манна"
4 Look at the words in Ex. 3 again and choose all possible answers for the questions. Model:Why are the friends going to this place? A: I think answers a) and c) are correct. Of course, the friends are looking for the treasure but they also want to do some sightseeing. В: I agree with you, but I think answer b) is correct too. They would like to make new friends too. 1. Where are the friends going to be in this unit? 2. Who are they likely to see in this place? 3. What are they likely to do? 4. What are the friends unlikely to do? a) Это фабрики, принадлежащие звездам. b) Это фабрики, выпускающие звезды. 2. You may have more luck. a) Возможно, вам больше повезет. c) Вы можете стать удачливым. a) Это самое важное событие, шоу и бизнес — ночь Оскаров. b) Это самое важное событие в мире шоу-бизне- са — церемония вручения Оскаров. c) Самое важное событие в мире шоу- бизнеса — это церемония вручения Оскаров. through a huge shopping mall called Hollywood and Highland. a) Вы будете удивлены, когда обнаружите, что "красный ковер", который ведет к театру "Кодак", на самом деле проходит через огромный торговый центр под названием "Голливуд и Хайлэнд". b) Вы будете удивлены, когда обнаружите, что "красный ковер", который ведет к театру "Кодак", на самом деле проходит через аллею под названием "Голливуд на возвышенности". c) Вы будете удивлены, когда обнаружите, что "красный ковер", который фотографируют "кодаком", на самом деле проходит через огромный торговый центр под названием "Голли вуд на возвышенности". 5. They pay no attention to the stars in concrete. a) Они не обращают внимания на конкретные звезды. b) Они платят невниманием конкретным звездам. c) Они не обращают внимания на звезды на асфальте. 7 Read the text for detail. Welcome to Los Angeles, also called LA. It's the second largest American city. LA is famous for one of its suburbs, Hollywood, which is the capital of world movie production. 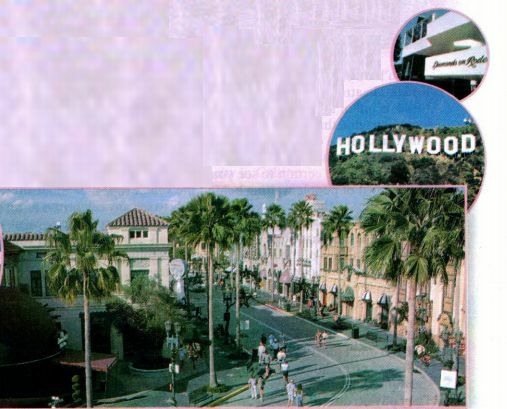 The biggest and most successful film studios — Disney, Universal, Fox, Warner Bros, Paramount, Columbia, MGM — are here. These are star factories. A lot of famous stars have been through the gates of these studios. Celebrities don't only work in LA, they also live in and around the city. Most celebrities' homes are in Beverly Hills, an area near\LA. It's a place where the stars can feel safe: the Beverly Hills police is sure to turn up seconds after a call. If there is one city that is even more beautiful and glamorous than Beverly Hills, it's Malibu, known for its beautiful beach. Here celebrities can look at the ocean from the windows of their multi-million-dollar homes. The stars' addresses are not a secret, and the public can drive past celebrities' homes, but you are unlikely to spot a star from the window of your car or a tourist bus. You may have more luck on Rodeo Drive in Beverly Hills where the expensive shops are. Julia Roberts or Barbara Streisand are likely to go there to do their shopping. Or try Hollywood Boulevard, with its world-famous movie theaters like Mann's Chinese Theater, the Egyptian Theater and the 3,300-seat Kodak Theater, where the Oscars take place. 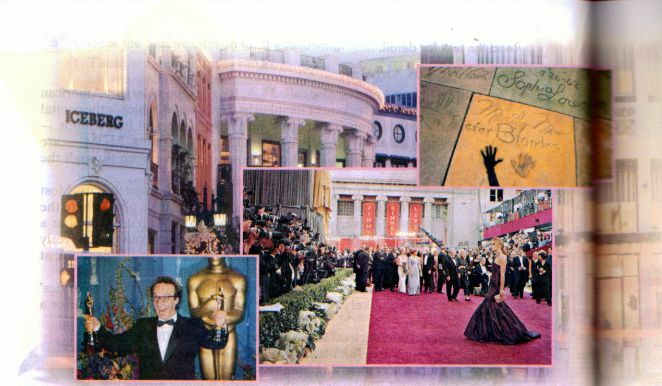 Every year, usually in February, celebrities are sure to come for the most important event in show biz: Oscar Night. On that day the prestigious Academy Awards, called "Oscars", are presented for the year's best achievements in the film world. You'll be surprised to find out that the "red carpet" area that leads to the Kodak Theatre is actually a huge shopping mall called Hollywood and Highland, which is full of shops and restaurants. This place attracts a lot of tourists who like to imagine that star directors like Stephen Spielberg or Quentin Tarantino will turn up for a cup of coffee just before the Oscars. They are unlikely to do so, because on the big day all the shops are closed and the public can't even go in. But you're certain to see your favourite star if you stand outside in the huge crowd of people waiting behind the velvet ropes. If you missed the Oscars, you're unlikely to see any celebrities on an ordinary day, but don't leave Hollywood Boulevard in a hurry. Look down at your feet and you'll see bronze stars set in the sidewalk. Look closer and you'll be able to read the names of the people who made Hollywood famous: film directors, producers, camera operators, actors and actresses, and musicians. It's the Walk of Fame, the most unusual monument to talent and success in the world. The tradition started in the late 1950s and now there are more than 2,500 stars in the sidewalk. Every year twenty new celebrities get their stars, but a star isn't cheap. It costs about $40,000 to install and look after one. If you don't look down, Hollywood Boulevard looks like an ordinary street. There are no architectural masterpieces, it's not very clean and it's full of little souvenir shops. In the evening teenagers often come to sing and dance here They pay no attention to the tourists and the stars in concrete. There is a pop song called "Celluloid Heroes" that 1 always remember when I walk along Hollywood Boulevard. The song was written by a group called the Kinks. Because she wanted to be alone. 8 Do the Hollywood Quiz and find out how much you've learned about Hollywood. c) the name of a film studio. a) the capital of the USA. c) the capital of world movie production. c) the largest film studios. c) the name of a famous actor. b) the celebrity homes found there. b) the Great White Way. 9 Write questions for these answers. 1. It's famous for Hollywood. 2. This abbreviation stands for Los Angeles. 3. The biggest film studios are called Disney, Universal, Fox, Warner Bros, Paramount, Columbia and MGM. 4. They live in Beverly Hills or Malibu. 5. Malibu is on a beach on the Pacific Ocean. 6. You're most likely to spot celebrities in the shops on Rodeo Drive. 7. No, they aren't. You can find their addresses in any tourist guide. 8. It's famous for its movie theatres. 9. The Kodak Theater is. 10. There are a lot of shops and restaurants there. 11. Because people like to think that they're likely to meet a star there. 12. You'll have to stand in a big crowd behind the velvet ropes. 13. The Walk of Fame is in Hollywood Boulevard. 14. It's the world's most unusual monument to talent and success. 15. It costs about $40,000. 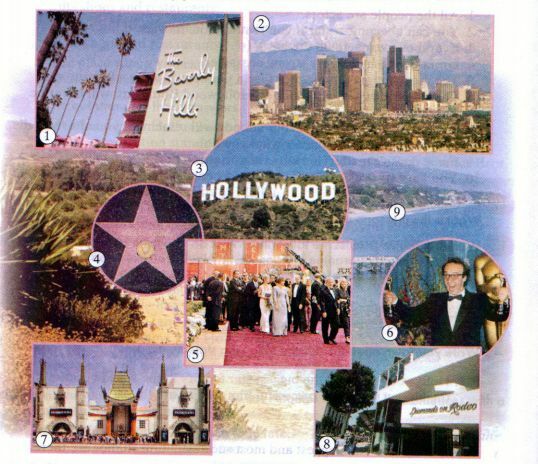 10 Look through the text "Welcome to Los Angeles" and find the sentences with a similar meaning if there are some. Model: The Malibu police may come late.— There are no sentences with the similar meaning in the text. 1. There's no chance of spotting a star from the window of your car or a tourist bus. 2. Julia Roberts or Barbara Streisand may go there to do their shopping. 3. Famous actors never go out of their homes. 4. That's a fantasy, because on the big day all the shops are closed, and the public can't go in. 5. You'll have a chance to see your favourite star if you stand outside in the huge crowd of people waiting behind the velvet ropes. 6. Even if you go to Hollywood and Highland, you won't see any celebrities. 7. On an ordinary day you probably won't see any celebrities. 8. The police will definitely arrive quickly. 9. You are unlikely to find out the addresses of any stars. 11 Read the extract from the song "Celluloid Heroes". Find the sentences which prove or contradict the following statements. 1. All the people are actors. 2. You can't become a star if you're not in the movies. 3. Everybody wants to be the best. 4. Greta Garbo had a very strong character. 5. The most important thing for Greta Garbo was to be a famous star. 6. The celebrities who get a star on Hollywood Boulevard will never be forgotten. 7. You can struggle for fame, but nobody will remember you after you die. 8. You can be a star no matter what you do. 9. Fame doesn't matter, it's more important to be happy. 10. You have to work and suffer a lot to become famous. 12 Is "Celluloid Heroes" a happy or a sad song? Explain your point of view. What is the message of the song? 13 Work in groups. Discuss the following: What do you think about success and fame? Are they a guarantee of happiness? Would you like to be famous? Report your conclusions to the class. A Write your own questions for the following statements. 1. Hollywood is called the biggest star factory in the world because the biggest and most successful film studios are there. ...? —Because the biggest and most successful film studios are there. 2. Oscar Night is the most important event in show biz. ...? — Yes, it is. ...? — Oscar Night is. 3. If you visit Malibu, you may see some famous stars. ...? — Some famous stars. 4. In Los Angeles you are unlikely to have bad weather. ...? — in Los Angeles. ...? — You are unlikely to have bad weather in Los Angeles. В Look at the pictures of the places that are mentioned in the text and write the names. Explain why you would like to visit them. С Substitute the underlined words and expressions with the following words and expressions. Make changes if necessary. 1. She'd like to be popular. 2. My best friend worked hard, but all his work didn't bring him anything. 3. My mother likes to read about famous people. 4. This part of Moscow used to be a village just ten years ago. 5. The ceremony will be in the Bolshoi Theatre on May 25. 6. Tell me what happened in the last series.